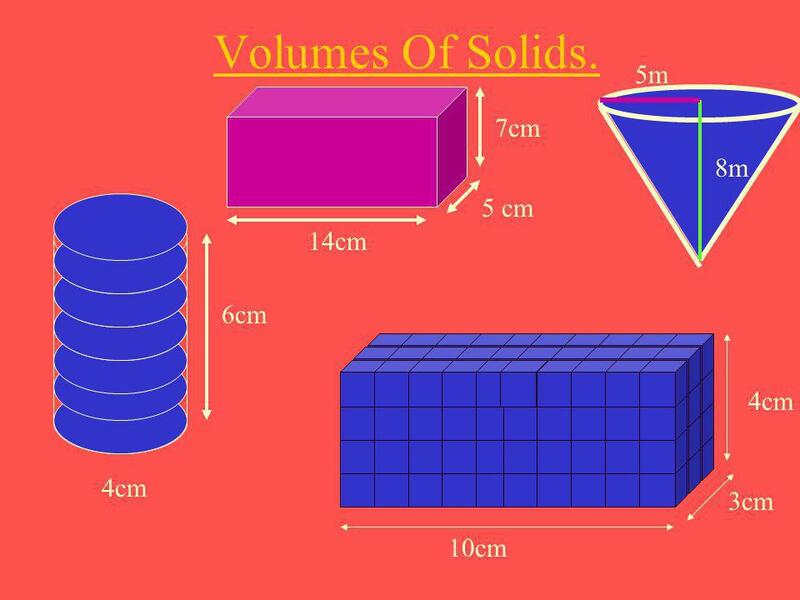 Volumes Of Solids. 8m 5m 7cm 5 cm 14cm 6cm 4cm 4cm 3cm 10cm. 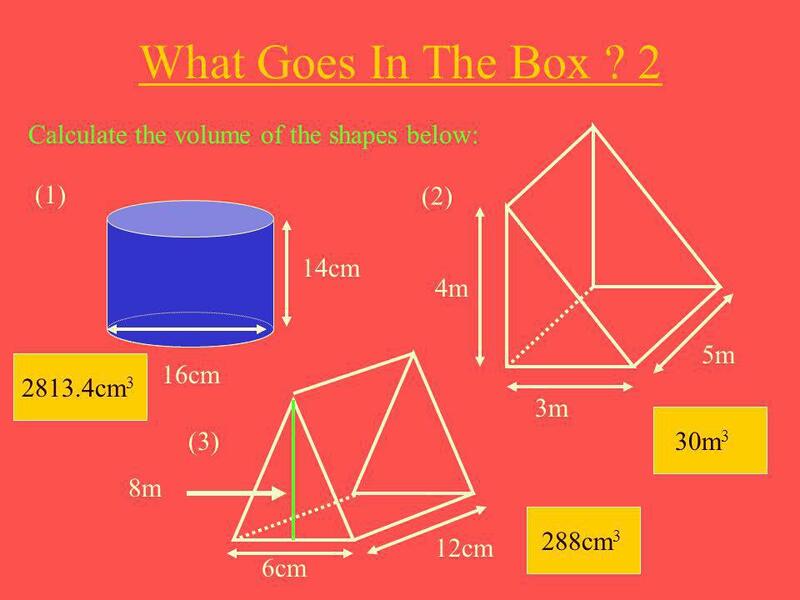 3 Measuring Volume. 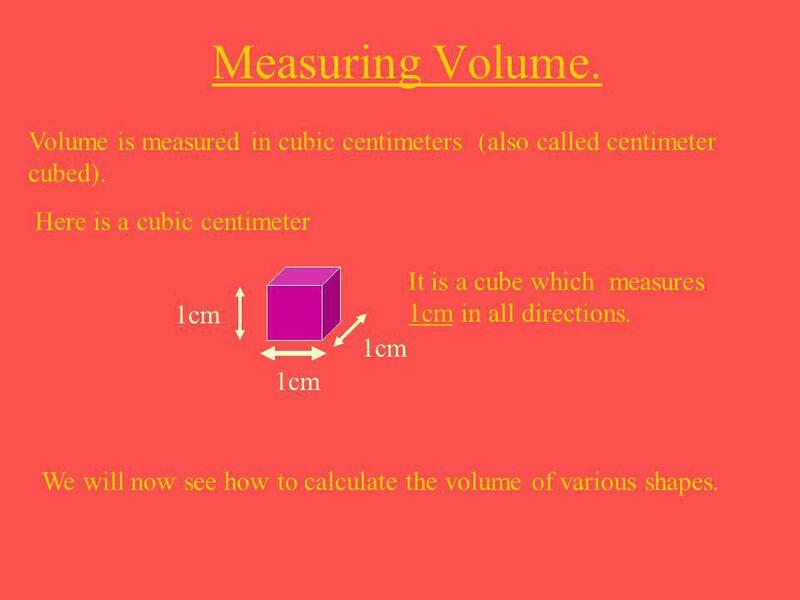 Volume is measured in cubic centimeters (also called centimeter cubed). 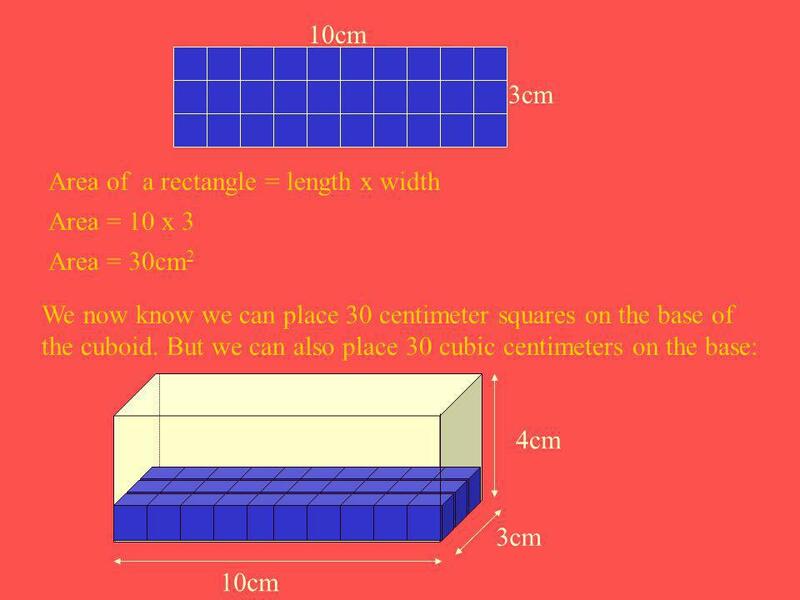 Here is a cubic centimeter It is a cube which measures 1cm in all directions. 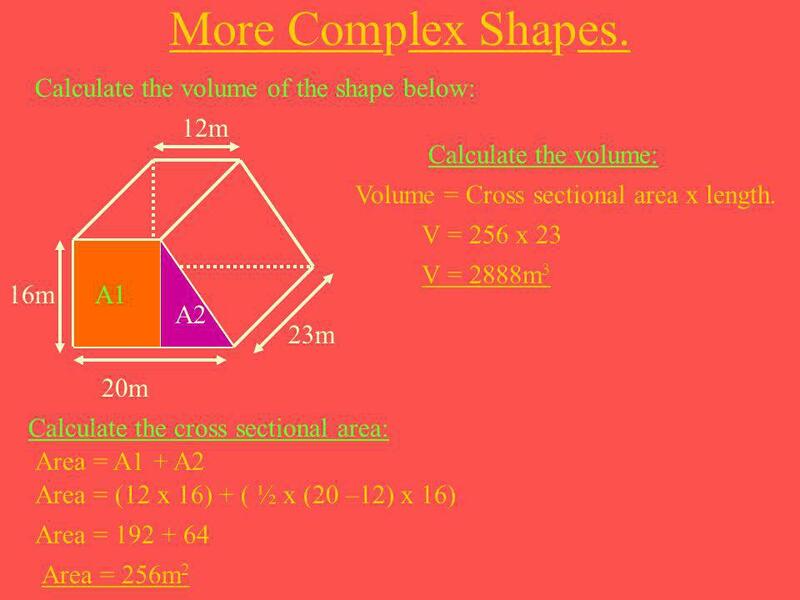 1cm We will now see how to calculate the volume of various shapes. 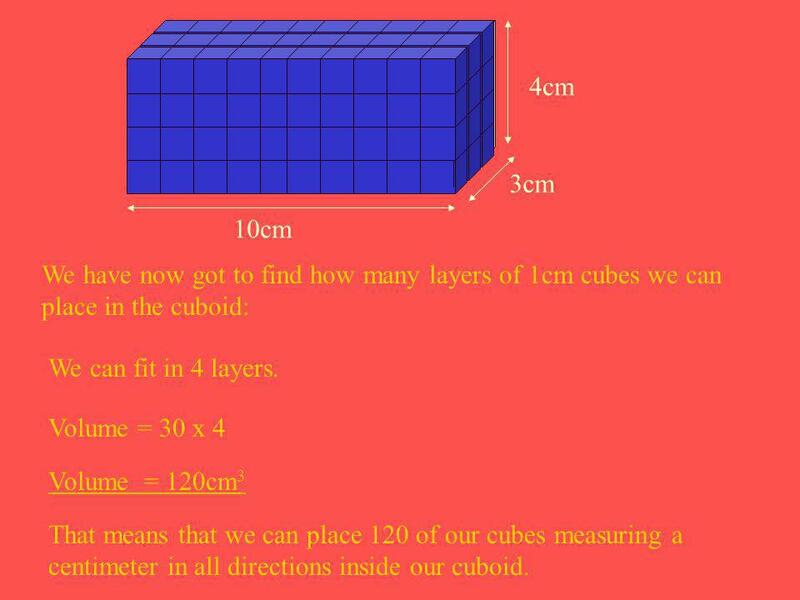 6 10cm 3cm 4cm We have now got to find how many layers of 1cm cubes we can place in the cuboid: We can fit in 4 layers. 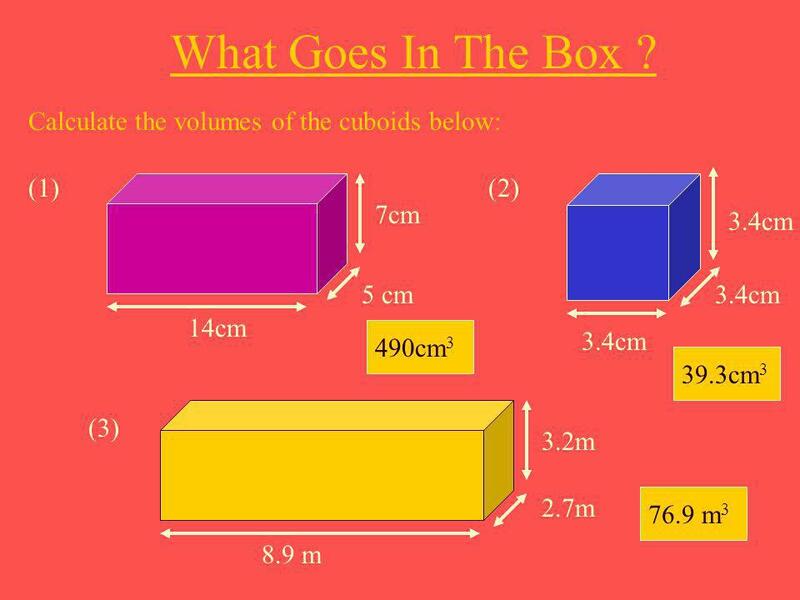 Volume = 30 x 4 Volume = 120cm3 That means that we can place 120 of our cubes measuring a centimeter in all directions inside our cuboid. 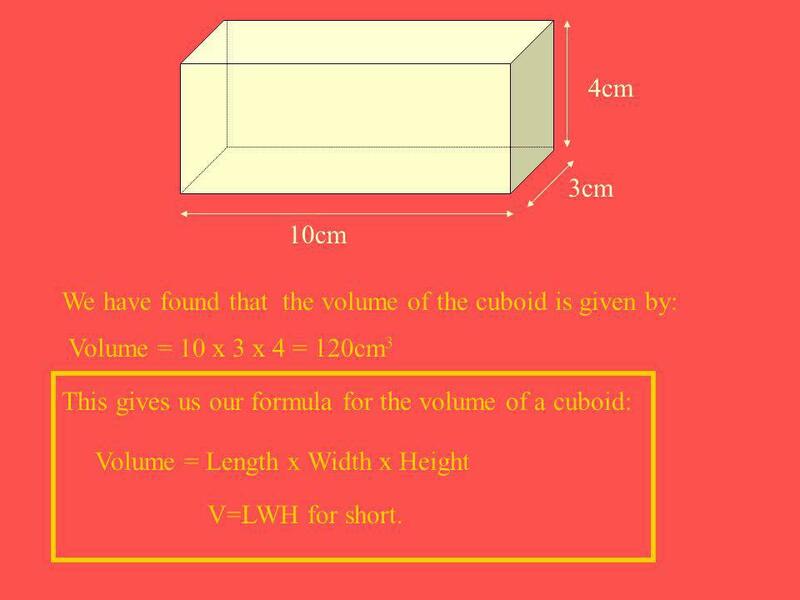 7 10cm 3cm 4cm We have found that the volume of the cuboid is given by: Volume = 10 x 3 x 4 = 120cm3 This gives us our formula for the volume of a cuboid: Volume = Length x Width x Height V=LWH for short. 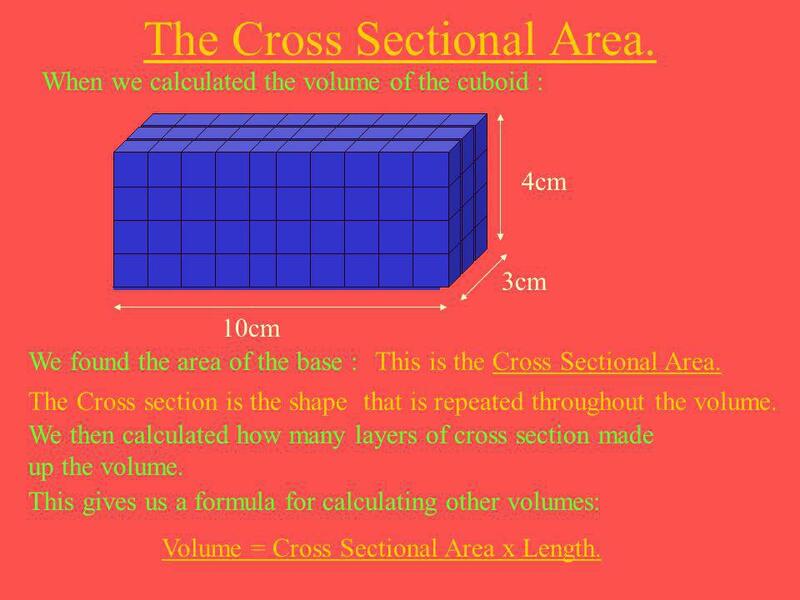 9 The Cross Sectional Area. 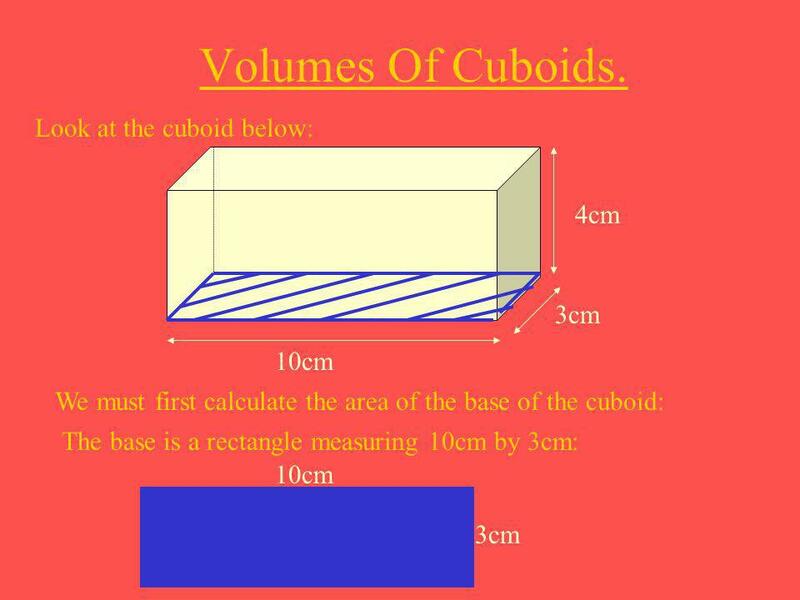 When we calculated the volume of the cuboid : 10cm 3cm 4cm We found the area of the base : This is the Cross Sectional Area. The Cross section is the shape that is repeated throughout the volume. We then calculated how many layers of cross section made up the volume. 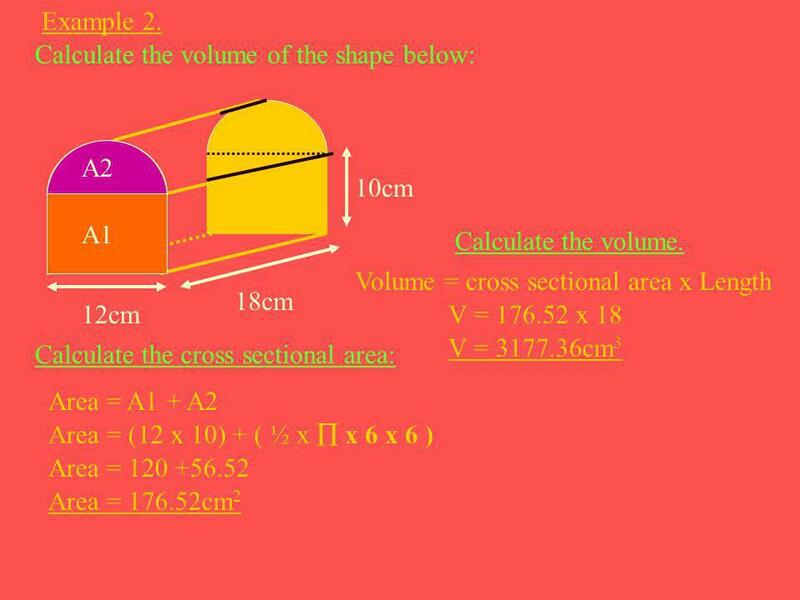 This gives us a formula for calculating other volumes: Volume = Cross Sectional Area x Length. 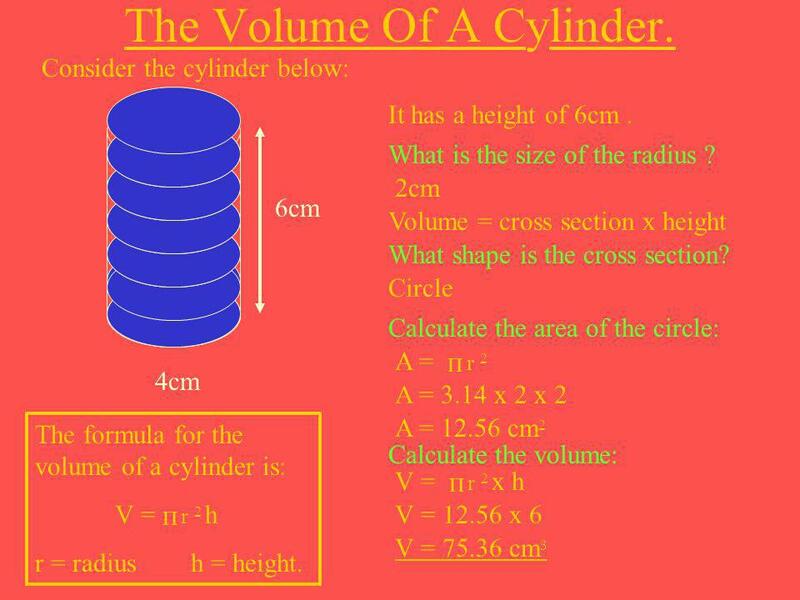 11 The Volume Of A Cylinder. 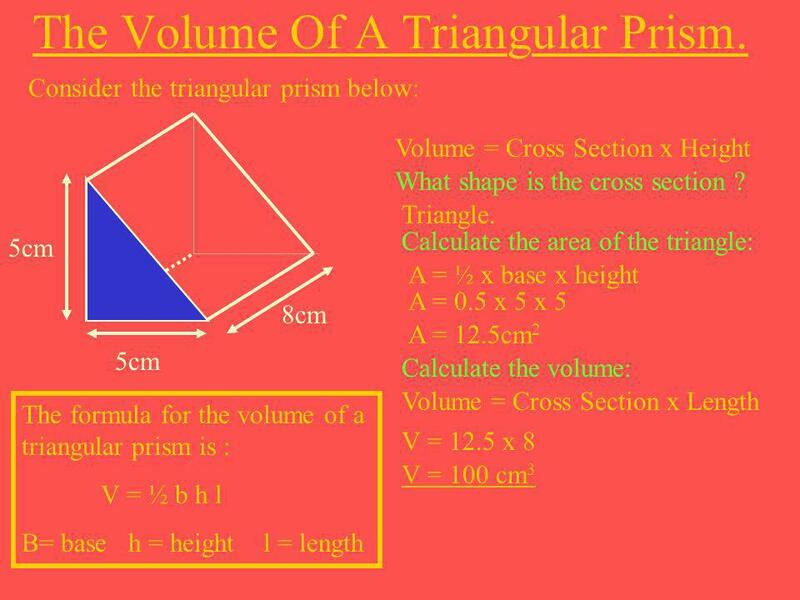 12 The Volume Of A Triangular Prism. The diameter (D) of the top of the cone and the cylinder are equal. 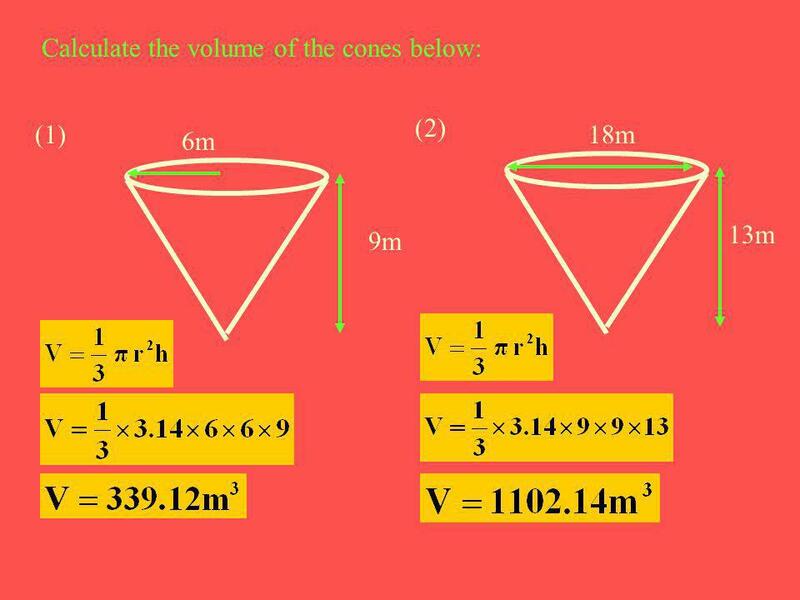 H The height (H) of the cone and the cylinder are equal. 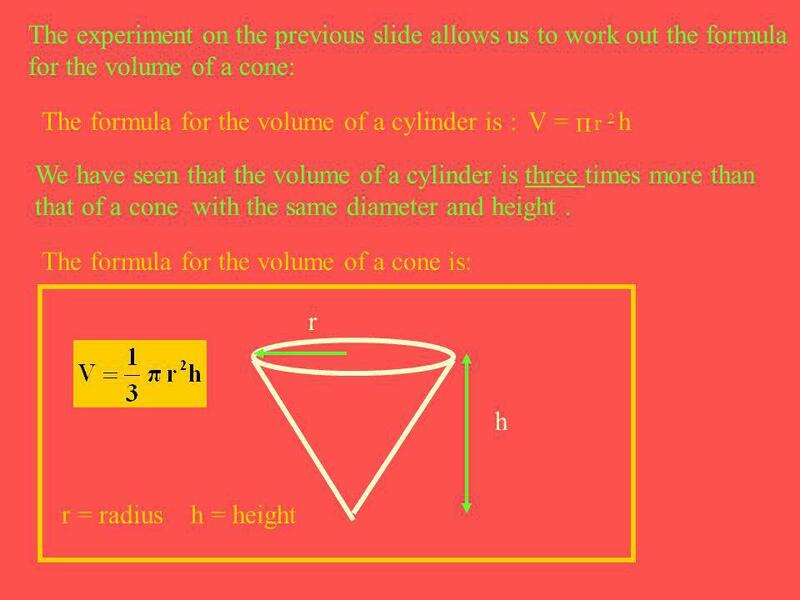 If you filled the cone with water and emptied it into the cylinder, how many times would you have to fill the cone to completely fill the cylinder to the top ? 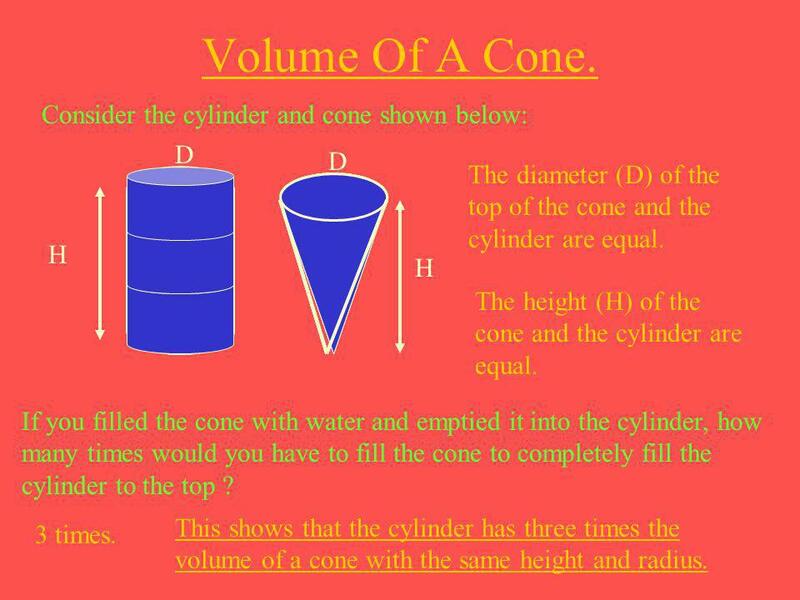 This shows that the cylinder has three times the volume of a cone with the same height and radius. 3 times. 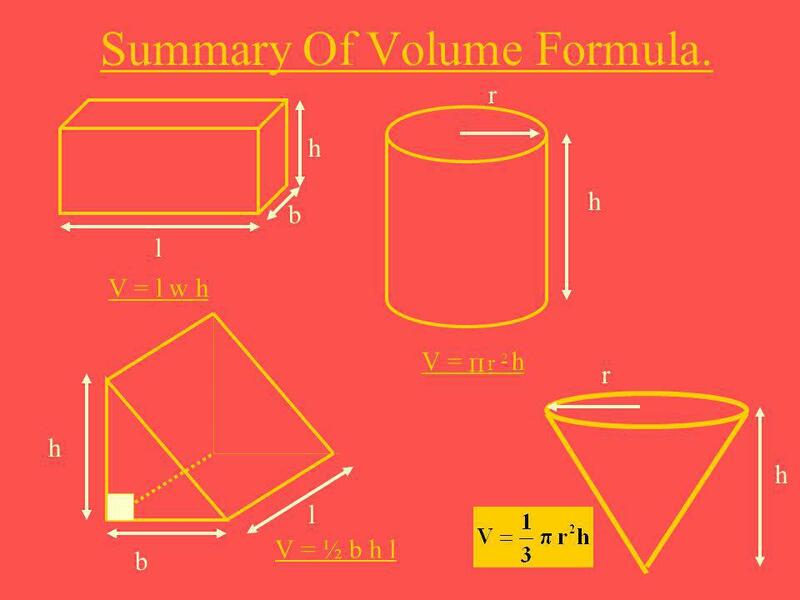 20 Summary Of Volume Formula. 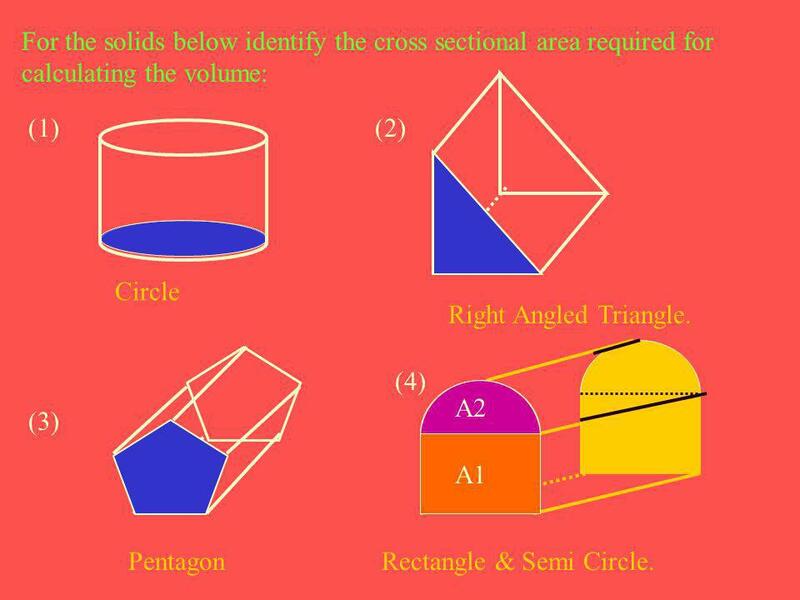 Download ppt "Volumes Of Solids. 8m 5m 7cm 5 cm 14cm 6cm 4cm 4cm 3cm 10cm." 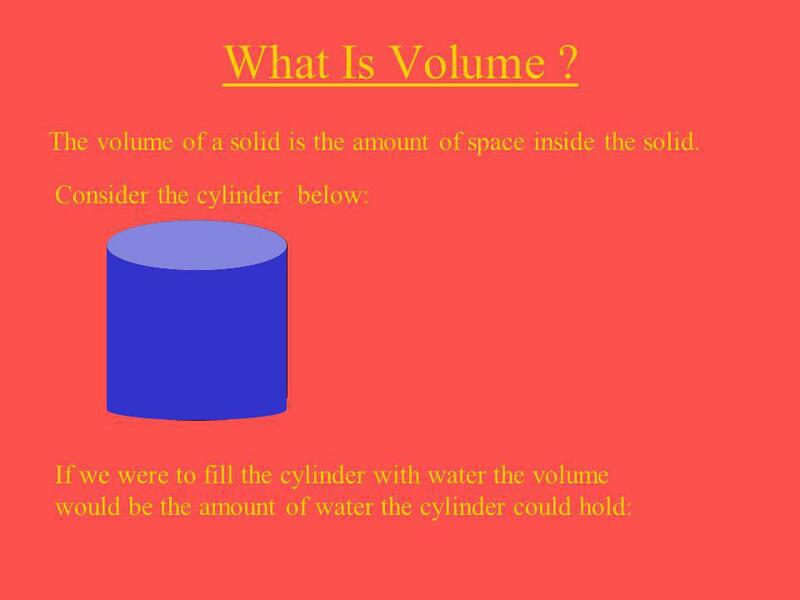 Volumes The measure of the amount of space a solid occupies is called the volume of solid. Preview Warm Up California Standards Lesson Presentation. Filling & Wrapping 7th grade SF, SA & Volume Formula Identification Vocabulary Terms VolumeSurface. 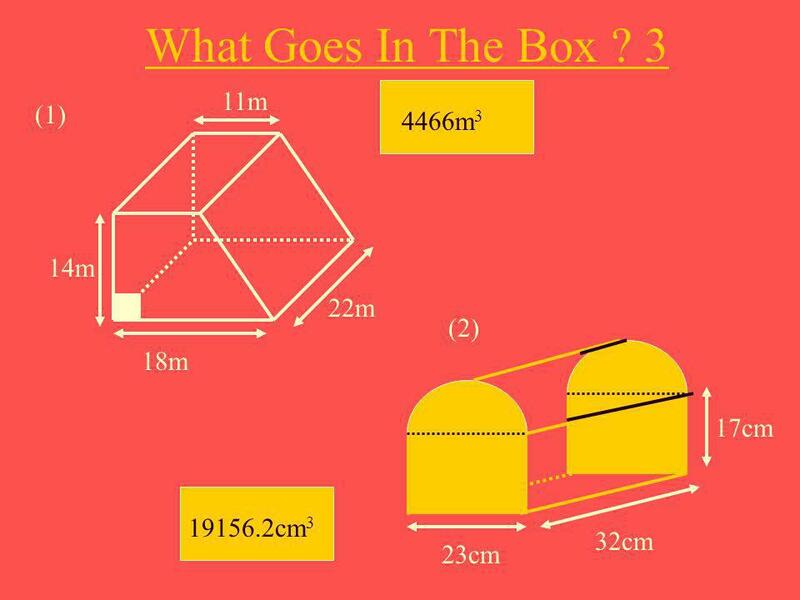 10.7 Volume of Prisms 6.4.5 I can find the volume in rectangular and triangular prisms.